If ‘Frankfurter Highlight’, ‘Uptight Neon’, ‘Data 70’ and ‘Fontanesi’ mean anything to you, chances are you were a young typography fan living in the eighties. They are all fonts from The Lettering Book by Noelene Morris. As any school kid in 1983 knew, The Lettering Book was essential for setting your poster projects apart from the crowd. Kids today have thousands of fonts available to them at the touch of a button but that doesn’t stop them attempting their own fancy writing. 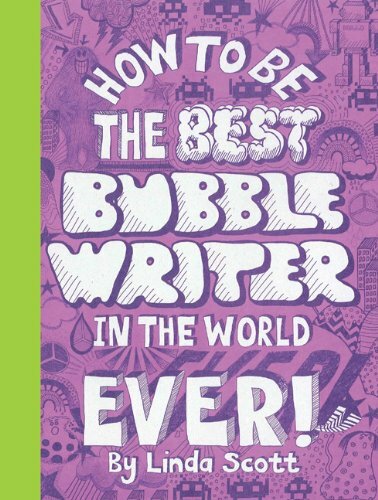 Fancy writing is as much fun now as it was in the eighties and recognising this, designer Linda Scott has put together How to be the Best Bubble Writer in the World Ever!. How to be the Best Bubble Writer in the World Ever! includes more than seventy fun, stylish and cool alphabets just waiting for your kids’ next poster page as well as ideas for logos, cartoons, invitations and more. Scott ‘gets’ kids and I know this because in her beautifully bubble-written introduction she says “Bubble writing IS big, it IS clever and it’s just about the most fun you can have with a pen. I’m sure that once you start bubble writing you won’t be able to stop.” And I think Scott is right. Her book is such a terrific creative starting point that kids will be inspired to make their own alphabets and soon crazy lettering will be popping up all over their drawings and projects. So what fonts will today’s kids remember fondly in thirty years? How about a bit of ‘Yeti’, a furry font with claws or the 3D ‘Robots’ that has a robot for each letter of the alphabet? 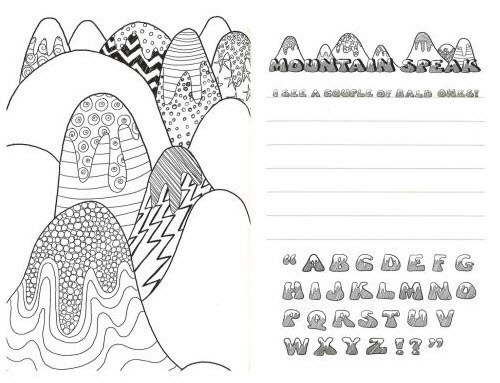 I love ‘Total Crazy’, ‘Rock On!’ and the hippy-chic ‘Peacedoodle’ and the geographer in me is itching to use ‘Groovy Contours’. I’m also wondering if anyone would notice if I wrote my next kinder committee meeting agenda in ‘Summer Cakes Add Some Sprinkles’ font? This book would make a ripping gift for school age kids. Scott concludes, “Go out there and be a great bubble writer!” and I conclude, go out and get this book because your kids will love it! How to be the Best Bubble Writer in the World Ever! is available from Fishpond for $13.22 (and for those of you suddenly wishing you had kept your copy of The Lettering Book, you can also find that at Fishpond, although the funky pop purple cover has been updated).